Susan completed her BS in Art Education from the State University College at Buffalo and in 2013 earned her MFA in painting from the University of Massachusetts Dartmouth. In addition, she completed numerous continuing education classes in drawing and painting at Rhode Island School of Design. She has worked as a gallery assistant in New York and Connecticut and a graphic designer in New York and Massachusetts. Presently, Susan teaches classes in drawing and painting and works in her studio located in Attleboro, MA. Susan has exhibited her drawings and paintings at the Attleboro Arts Museum, Attleboro, MA, Danforth Art Museum, Framingham, MA, Galetea Gallery, Boston, MA, and Soprafina Gallery, Boston, MA. Her work can be viewed on her website at susanbauer.net. With the mink stole series I have utilized different media to interpret line, including charcoal pencil, colored pencil and gold leaf. My motivation is to show the materiality of the fur, to illustrate texture and form on paper using line. Many small lines are used to create my drawings, I like to refer to the process as manic mark making. The marks I create follow the direction and movement of the fur, describing the nature of the fur. 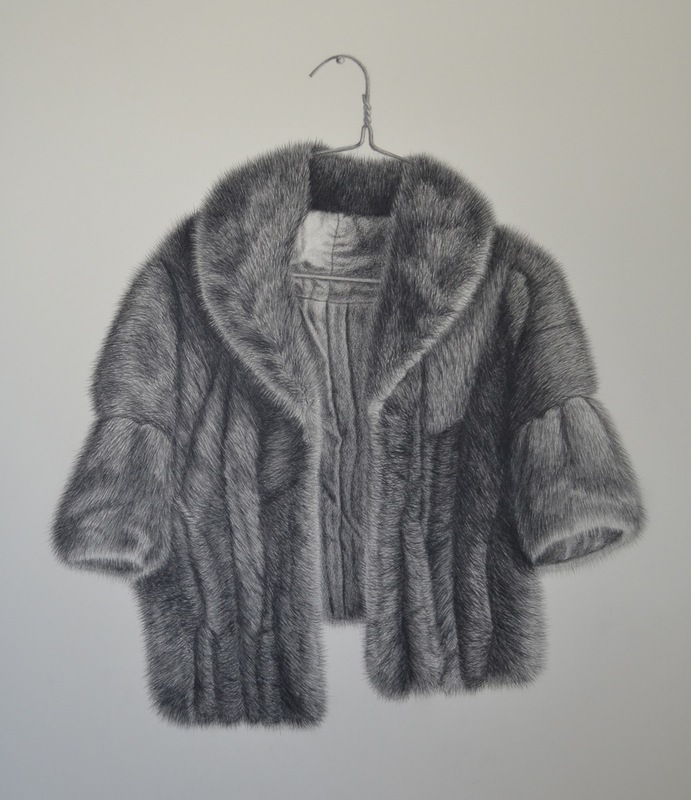 I began this series of drawings with the mink stole hanging on a wire hanger. My most recent drawings suggest the human form, only the mink stole and a gold necklace represented, the human figure conspicuously in absentia, a ghostly form suggested under the mink stole.